If you own a business, sweepers can help you clean the inside flooring and the outside parking lot or streets of your business. They can help you maintain a customized sweeping schedule, so you don’t have to rely on cleaning services to keep your property sparkling. Deciding to invest in a sweeper means you’re equipping your team with the machines and tools they need to maintain floors and outdoor areas. Whether it’s a spill, sudden storm or other occurrence leading to debris on your floors and streets, sweepers can help you clean up the mess in minutes. In fact, today’s sweepers come with many amenities — such as air-conditioned cabs, water-saving features and more — to make cleaning easier and more pleasant than ever before. To keep your floors clean, walk-behind sweepers are one option. Highly flexible, walk-behind sweepers can be pushed and are small enough to fit into smaller areas. They are easy to store when they’re not in use. Walk-behind sweepers can still save your team a lot of physical effort when cleaning and can help your employees clean floors in less time when compared with a mop and broom. Sweepers, with their higher-speed brushes, can also do a better job of cleaning the floors — and with less physical labor — even when they’re extremely soiled. Walk-behind sweepers come in two models: manual and automatic. Manual machines must be pushed forward, which can increase operator fatigue. Other models move forward on their own, so they call for less exertion. Compared to walk-behind sweepers, ride-on sweepers can cover larger areas of flooring in a shorter period of time. Ride-on sweepers range from smaller units to very large sweepers with enclosed heated and air-conditioned cabs for the operator. Compared to walk-behind sweepers, these sweepers cover wider cleaning paths, meaning more of your floors are cleaned with every pass. Ride-on sweepers usually have larger tanks when compared with walk-behind models, which means your operators can continue cleaning for a longer period of time before replacing water and cleaners. This lets them clean larger floor areas without breaks or interruptions. Ride-on sweepers come with many features and options. For example, there are ride-on sweepers with extraction processes to make it easy to remove and fill the sweeper with cleaning products and water. There are also models with powerful vacuums to lift off debris. Ride-on sweepers can increase productivity by up to 400% when compared with basic walk-behind manual models. In some cases, however, ride-on sweepers can be a disadvantage. They are larger, so they may require more operator training. Also, they are not as maneuverable when compared with small walk-behind models. They have a harder time getting into smaller spaces and around obstacles. If they bump into anything — such as office furniture, displays or people — they can cause more damage when compared with walk-behind equipment. In addition, you will need a place to store these larger machines when they’re not in use. Compact ride-on sweepers. These models are becoming popular because they offer some of the operator comfort and convenience of medium and large models but with added maneuverability. They are easier to store when not in use and may be less intimidating than large machines. They offer more features and options than most walk-behind sweepers and can be used in offices and stores where shelving might not offer enough room for larger sweepers. Medium ride-on sweepers. Midsize ride-on models are an option for floors without too many obstacles. They will not fit through the narrowest of doorways, but they are maneuverable and are often used for retail spaces and offices. Large ride-on sweepers. Large models are often used in warehouses, conference halls and other large surface areas. These models tend to have the widest cleaning paths, largest cabs and plenty of features. They have powerful engines and a long battery life. Some offer special attachments that allow debris and water to be poured into a dumpster or container without requiring the operator to leave the vehicle. Street sweepers can clean along walkways, streets and other outdoor areas. Although many cities use large city sweepers and street cleaners, many businesses get frustrated because these larger vehicles can blow debris onto pedestrian areas and business property. In addition, street cleaners have a fixed schedule in most cities. If a street becomes filled with litter or debris between cleanings, it may remain there until the next scheduled cleaning. You can use street sweepers for sidewalks and other walkways where clients and pedestrians walk. Keeping these areas clean presents the best impression of your business. It can also help prevent injuries and costly lawsuits against your business. If someone falls on your business property, you could face legal action. Keeping your business property clear makes good business sense and helps keep everyone on your property safe. Cars and pedestrians both use parking lots, so these areas become dirty quickly. Leaking oil, gasoline and other fluids can stain the surface of your parking area and pose a hazard for other cars and pedestrians. It can also damage your parking lot surface. Debris and litter in the parking lot can create an unprofessional look and even cause trip and fall accidents. Parking lot sweepers let you clean your parking area often, protecting both your property and the users who park in your lot. If your company is interested in buying floor sweepers, street sweepers or parking lot sweepers, you can buy a new model or a refurbished used sweeper. The cost of a used machine is less than the cost of a new piece of equipment, and off-lease and used models may offer years of cleaning before they need replaced. When you purchase used cleaning equipment from Bortek Industries™, for instance, you enjoy peace of mind because our professional technicians carefully evaluate and repair each sweeper to its best condition before it is available for resale. With a wide range of sweepers available from different brands in different capacities, Bortek Industries™ offers a used model for your cleaning needs. If you want the floors of your business to sparkle, consider walk-behind and ride-on sweepers. With smaller ride-on sweepers available, the choice between walk-behind and ride-on models has become more challenging. The price points between the more advanced walk-behind models and the smaller ride-on sweepers can be similar, and you may wonder which machine is best for your business. Floor space. If you have a large floor space — over 700 m² — it may be physically difficult or even impossible for your staff to use a walk-behind sweeper and keep your floors in good shape. For example, if a floor space takes over two hours to clean with a walk-behind model, your staff members will spend a considerable amount of time on their feet, maneuvering the cleaner.For large spaces, a ride-on sweeper will help you cover a larger area in less time, making your cleaning more efficient and cost effective. If you have a small floor space, you may not want to invest in a larger ride-on sweeper. Walk-behind models, in this case, offer more flexibility while keeping your smaller floor space clean. Obstacles. Because of a wider cleaning path, ride-on sweepers require more room. If your office space or commercial property has many obstacles — such as narrow shelving, narrow hallways, stairs, desks, displays and other items on the floor — a walk behind sweeper can offer optimal flexibility, particularly around tight corners and in small spaces. Smaller sweepers also make sense if you have lots of foot traffic during cleaning operations, because the smaller models are easier to maneuver around people. Walk-behind sweepers can also easily fit into doorways, even narrow ones.If you have large floor areas with few obstacles — for instance, if your building has lobbies, conference rooms, meeting rooms and other large open areas — a ride-on sweeper might be the better option. Your operators. Ride-on sweepers mean less operator fatigue and greater operator comfort. Operators can sit while cleaning your floors, and in some cases even enjoy heating, air-conditioning, the radio or other features. If your operators have disabilities or mobility issues, ride-on sweepers can make it easier on them.If your floors need frequent cleaning, it may cost your organization more to operate walk-behind sweepers. They have a narrower cleaning path, so you may need to pay for more hours of work from your operators, potentially increasing your cleaning costs. Ride-on sweepers allow operators to work at a faster pace and clean more in the same amount of time. 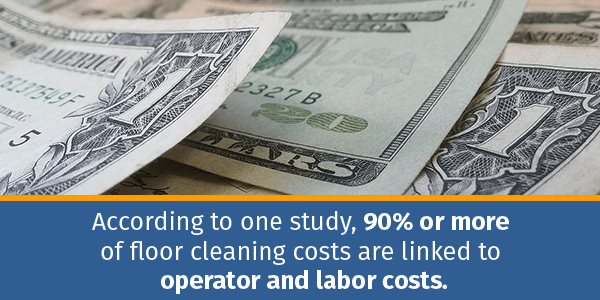 Since 90% or more of floor cleaning costs are linked to operator and labor costs, according to one study. If your operators are more efficient with a ride-on sweeper, you will also enjoy a more budget-efficient cleaning process. Your industry. If you work in a healthcare field, food or beverage industry or other industry where cleanliness is essential, your floors may need to be cleaned multiple times a day. In these cases, ride-on sweepers can allow your staff to clean quickly and efficiently.Make sure the sweeper you choose offers the level cleaning you need. For example, you may need a sweeper designed to minimize dust or one with vacuuming features to remain compliant with your industry standards. If you will be cleaning high-traffic areas, look for sweepers offering different cleaning modes, which let you clean lightly with minimal water. Your floors will dry fast, and slip-and-fall injuries could be prevented. Choosing your commercial cleaning equipment is a major decision for your business. It’s an investment that should last for years, and it could affect your cleaning schedule, staff and business performance for years to come. If you need help making a decision or would like to look at a range of sweepers, contact Bortek Industries™ to see our vast selection of off-lease, lease, refurbished and used floor sweepers. We also offer service and maintenance, so you can enjoy peace of mind with your new sweeper. The cleaning features you want and need. Ride-on sweepers offer more features. Walk-behind models don’t typically offer dust reduction abilities, extraction and burnishing features to pick up debris and polish floors, and other options designed to help you clean more effectively and deeply. Ride-on sweepers may be better equipped to deal with a variety of floor surfaces and cleaning needs. If this is important to you, the extra functions available with ride-on sweepers are something to consider. The outside of your business impacts your customer and client retention. In fact, the curb appeal of your business can be exponentially significant to your overall success. A clean, inviting outdoor area creates curb appeal, which can encourage people to enter your business, store or offices. An outdoor area littered with debris can create a negative image for your company and, in some cases, can lead to injuries if someone trips, falls or slips in an improperly maintained parking lot, street or walkway. Sweepers help you get rid of rocks, loose aggregate, gravel, glass and other sharp debris that could potentially harm your asphalt surfaces. 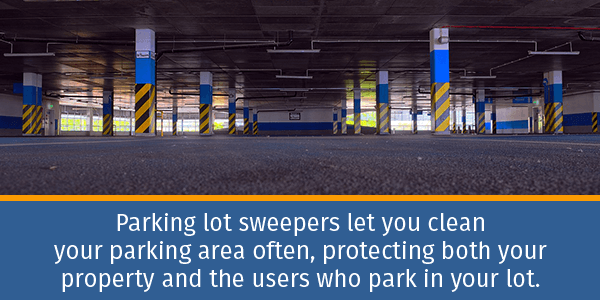 Regular cleaning of your parking lot will help you avoid having to frequently. Regularly using sweepers lets you remove litter and debris hiding in cracks and other issues that could potentially become costly if they’re not handled right away. Regular cleaning will also keep pests away from your property, possibly protecting your business and inventory. Function. You can choose models with a suction hood and vacuum features or models with both brushes and vacuums, allowing you to sweep up debris and also to polish away dirt. Weather. If your business is located somewhere with winter conditions, consider parking lot and street sweepers with winterization options such as snow tires, as well as headlights for low-light conditions. Make sure the models you choose are heavy-duty enough to perform in colder or adverse weather. Capacity. Look for sweepers with enough engine strength and containers to hold all the debris and cleaning solution. Working width. If you have a large parking area, a wider working width will save operators driving time and will make your cleaning more efficient. Do You Need Sweepers for Your Business? At Bortek Industries™, we offer a range of sweepers for all of your commercial cleaning needs. Browse our self-propelled walk-behind sweepers — including styles from a 28” to 32” cleaning path — or our Advance sweepers with options from 37” to 84”. We offer a variety of the most trusted brand names in commercial cleaning equipment, including Clarke, American Lincoln, Advance and PowerBoss®. Whether you want new sweepers, refurbished sweepers, service and repair, leased models, parts, or professional advice, you can count on Bortek Industries™ to help you keep your business in pristine condition. Bortek Industries™ works with leaders in a variety of fields, including manufacturing, government, hospitality, warehousing, healthcare, retail, education, distribution, food and many other industries. Our experience means we understand the unique cleaning needs of businesses like yours, and we always work to provide customized solutions and equipment. We help you give the best impression for customers and pedestrians, both inside and outside of your buildings. We carry parking-lot sweepers to help you maintain outdoor areas, making them clean and safe for you, your customers and your team. With sweepers from Wayne, Nite-Hawk and Stewart-Amos, we offer several options. If you’d like to enjoy more control over your cleaning and want your business to look its best, contact Bortek Industries™ to find out more about our industrial cleaning equipment.